It&apos;s Labor Day weekend and the L.A. Times&apos; The Taste festival is here. The annual food fest takes over the Paramount backlot, temporarily transforming it into a massive epicurean pop-up and block party highlighting Southern California&apos;s unique culinary scene and the chefs who make it happen. The festival opens with a cocktail party tonight and hosts events through the weekend helmed by the Times Food staff and acclaimed chefs and bartenders. We are especially excited for Sunday&apos;s "Flavors of L.A." event, which will be led by civic icon/Pulitzer Prize-winning restaurant critic Jonathan Gold, alongside Night + Market chef and owner Kris Yenbamroong. Gold will explore L.A.&apos;s growing Filipino cuisine scene in a roundtable with three acclaimed chefs: Charles Olalia (Rice Bar), Gary Menes (le comptoir) and Alvin Cailan (EggSlut/UNIT120/AMBOY), and Yenbamroong will demo his classic Thai cooking along with presentations from several other chefs, including Baroo&apos;s Kwang Uh. 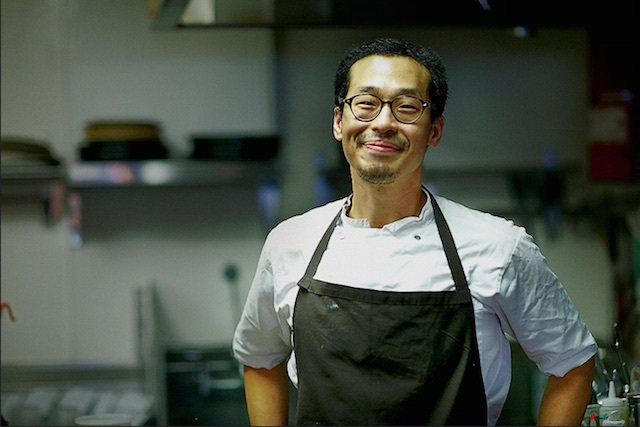 As a preview, we chatted with Kwang Uh about Baroo&apos;s freestyle Korean food, what drew him to his newly adopted city, fermentation, watermelon rind pickles, and the Eastern philosophies that helped shape his restaurant&apos;s ethos. For those unfamiliar with the relative newcomer, Baroo is the rare much-hyped restaurant that&apos;s actually worth the hype. 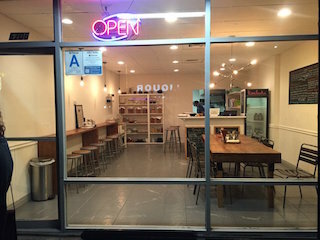 The tiny, fermentation-driven joint in an East Hollywood strip mall was recently named one of five best new restaurants in America by Bon Appetit. 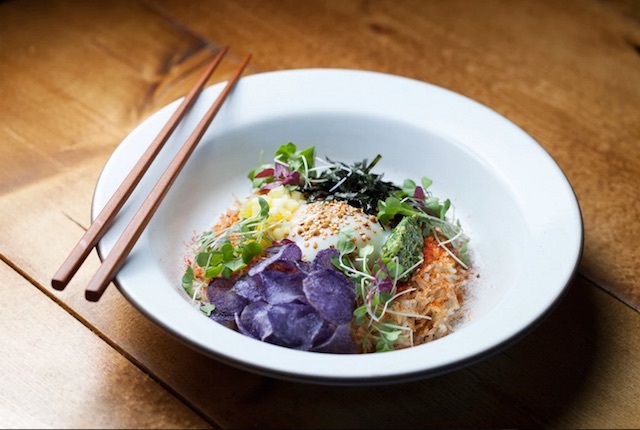 Uh arrived in L.A. last July, and the restaurant opened in August, garnering a rave review by Gold in the Times a mere three weeks into its tenure. What drew you to L.A.? My business partner and friend Matthew Kim has been living here for almost seven years. We knew each other in university. I was a freshman and he was a senior. At the time, we&apos;d talk about the restaurants and our shared points of view and we&apos;d talk about opening a restaurant [outside of Korea]. We looked at a few different sites in the states... L.A. is really one of the most intriguing and interesting cities. I think starting from a few years ago—maybe five or six years ago—[the city&apos;s restaurant scene] been changing gradually. I think L.A. is one of the most-"melting pot" cities. It gives L.A. a fresh breath. They are open to everything. Restaurants that started here have pioneered [the scene]. There are a lot of young chefs with different experiences from other countries and states. You&apos;ve worked under many famous chefs, at Daniel, Noma and Nobu. After so many years working under chefs known for their own particular styles, what is it like to have the freedom to experiment on your own? It&apos;s pretty simple. We didn&apos;t have any investors, especially in the states, and I didn&apos;t have that much of a social network, pulling strings or anything like that. Compared to my country, Korea, I didn&apos;t know anything in L.A. It&apos;s better for us. Even if someone has worked in many prestigious kitchens before, they cannot prove themselves if they don&apos;t have any of their own restaurant experiences. We didn&apos;t actually even try and find any investors before opening the restaurant. I just want do my best under our control. It&apos;s low-budget—under that situation, I can&apos;t do the fine-dining that I used to love and practice. I used to work in that setup and this is completely different. It&apos;s really great motivation and a great challenge, which makes me really happy. Fermentation is very important to the food you serve at Baroo. 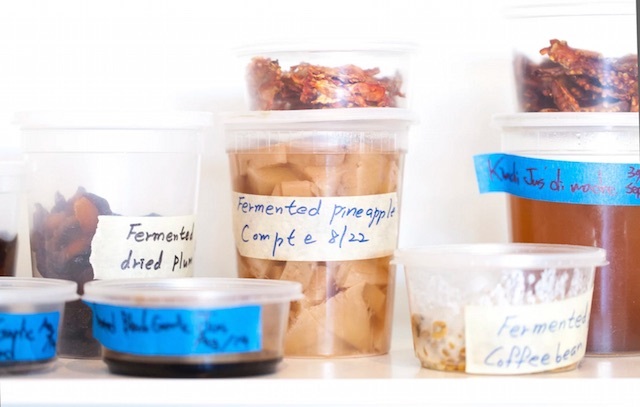 Was your love of fermentation something you got from working in the Noma test kitchen, or did you go to Noma because you were already interested in it? I did my stage [staging, which comes from the French word stagiaire, is a kind of restaurant apprenticeship] at Noma for three months. In terms of fermentation, I absolutely learned a lot [at Noma]. First of all, their point of view and perception on fermentation is totally new and totally creative. Korea is a fermentation country. Everything is fermentation, every side dish and every condiment. Even kimchi. And there are a lot of side dishes, like fermented soy paste or fermented chili bean paste. But how Noma is using fermentation techniques was a completely new world to me. People in L.A. talk about the "Jonathan Gold effect"—the explosion after he writes about a place. Was that something you experienced? Absolutely. No doubt about it. It&apos;s kind of gradual, the first time [was when] Farley [Elliott] from Eater LA wrote about our opening, and then after that somebody came here and they told Amy Scattergood from the L.A. Times about [Baroo]. After that, many restaurant business people and foodies came here. That&apos;s how Jonathan Gold came here. And after he came here, it was completely different. He&apos;s really popular and famous in the states, and I think worldwide. Before even opening this restaurant, I knew about Jonathan Gold. It was a Wednesday and he just came in with his family. I was really surprised. I didn&apos;t first recognize name, Matthew did. He said "It&apos;s Jonathan Gold, Mr. Gold came here." And my first reaction was "what?" And then I went out of the kitchen and got his order and told him I was a fan. I was kind of nervous. And then we were trying our best to serve the food. We were kind of busy at the time. We were scared and nervous and very happy. Last I came to Baroo you didn&apos;t have a sign outside, do you still not have a sign? What&apos;s the appeal of not having a sign? It&apos;s kind of a long story. When we first opened this restaurant, and still now, I&apos;m very proud of what we are doing. I&apos;m kind of practicing to find my own style and define myself. So that&apos;s why I don&apos;t want to put the Baroo sign outside. To me, it&apos;s more like an Oriental philosophy. I was influenced by philosophies like Taoism and Buddhism. [The word "Baroo" means a bowl that Buddhist monks are allowed to possess and use for their meals until their last breath.] If you choose some name, it&apos;s an action to make a boundary of yourself. That was one of the reasons. Another reason is that we did everything by ourselves, like interior design, and at the time we were kind of tight of budget. The former restaurant was a Thai restaurant, Thai noodles, and it [looked] pretty good after taking off the letters, so in the end it&apos;s kind of blank. That&apos;s how I felt about this restaurant, cuisine and concept-wise—you can&apos;t say it with one word. Like "Korean." It&apos;s not even "American" or "Korean" for sure. If I had to say, maybe fusion. Tell me more about what your role is going to be at the L.A. Times Taste Festival. Right now I&apos;m kind of working on the recipe for the demonstration. I introduced our own condiments, like fermented condiments, which enhance the flavor and develop the umami. Dish-wise, I&apos;m going to make a fermented seaweed fried rice, or something like that. I love the watermelon pickles, which I&apos;ve never seen anywhere else. How did you come up with the idea? For a long time, many people and restaurants have actually been doing watermelon rind pickles. I don&apos;t think it&apos;s new or interesting. I like them because they&apos;re from my childhood memories. When I was growing up in Korea, the financial situation in the country was going up, but when I was very young it was not that good compared to the present. So I liked the watermelon rind pickles because my mother used to make the rind pickles after we had lots of watermelon in the summer time. I have great memories of the texture and the very subtle, floral [flavor]. It smells floral when you taste the watermelon rind. The childhood memory made me start making them, but I want to highlight the watermelon flavor and taste. When I make watermelon rind pickles, I use watermelon juice so it really has that watermelon flavor. Everything from the old. A long time ago, worldwide, everything was not so abundant. That&apos;s why many people, our grandparents&apos; generation, they knew how to use everything from nature. 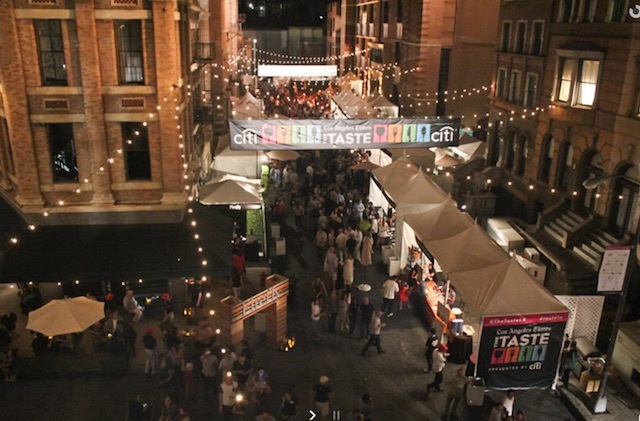 The Taste will be held Friday night, Saturday and Sunday at Paramount Pictures Studios. Tickets range from $100 to $150 and are available here. Sources and muses, behind the counter at Baroo.